The racist poster, seen in Ayr. 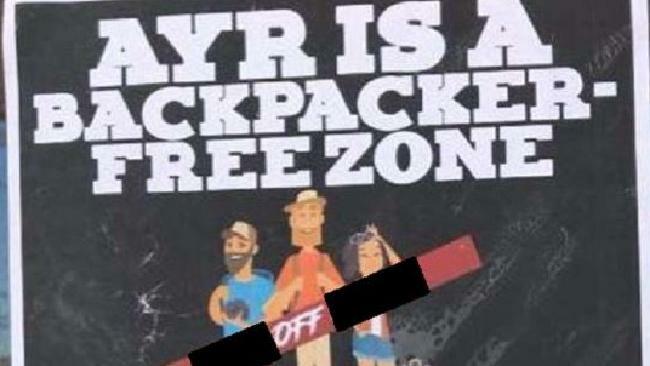 BACKPACKERS from across Australia have expressed frustration over a poster claiming travellers were not welcome in the Queensland town of Ayr. 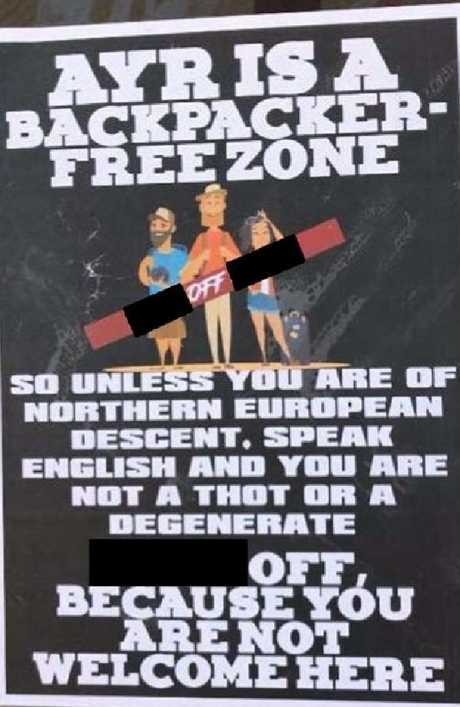 The profanity-laden flyer reads: "Unless you are of Northern European descent, speak English and you are not a thot (sic) or degenerate, f*** k off, because you are not welcome here". Dutch traveller Yuri Struycken said the "preposterous" flyer, which was taped to a local shopfront window, made her feel incredibly discriminated against. "They are acting like we're beasts who are just out to party and to destroy their society," Ms Struycken said. She said travellers worked hard and respected the communities they gained employment in. "If they don't want backpackers in Ayr, so be it," Ms Struycken said. "Let them fall like one of the many mining/agricultural towns here in Australia. There are plenty of farmers, restaurateurs, business owners who are incredibly happy to have the help from backpackers." British traveller Lyndsey Peel said the racist and explicit poster was confusing. "It claims northern European persons are welcome but backpackers aren't … so as both of those things I would be curious to know if I am allowed there?" Ms Peel said. "In my country they wouldn't get away with posting it as it's discriminatory and marginalising a group … But it's not clear which group it is!" French backpacker Adly Wayne said the poster was nonsense. "I really don't understand why someone would even take time do such a stupid poster," Mr Wayne said. Despite the vicious poster, Mr Wayne said he had never come across a local with negative feelings towards backpackers in the Burdekin. "During my short stay there, I met welcoming and really helpful people," he said. Within hours of being notified, Burdekin Shire Council Mayor Lyn McLaughlin issued a statement condemning the "vile" poster targeting backpackers. "I'm appalled … the person responsible should hang their head in shame," Cr McLaughlin said. "We wholeheartedly welcome backpackers to our region, not only for the crucial work they do in our horticultural industries but for the cultural diversity they add to our community."